One of the great advantages of having our school located outside the city center is that we have many opportunities to observe our natural surroundings every day. We are also extremely lucky to have neighbours who want to share their knowledge of the world with our students. We are very fortunate indeed to have the cooperation of local farmers who have agreed to teach our students how to plant rice. And not only do the kids get to learn the lesson, but they also get to put their knowledge into practice in the fields! 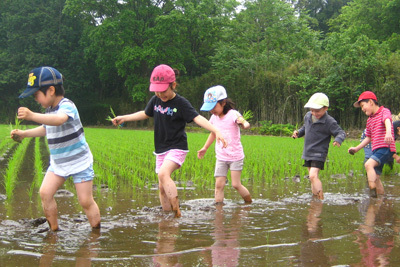 On May 13, we took off our socks and shoes and went to work on a patch of a rice paddy that the farmers had reserved especially for us. It will be exciting to see the field again when the rice is ready for harvesting!